Sant Benet de Bages (Fig. 1) is a Romanesque monastery located in the village of Sant Fruitós de Bages, 60 km north of Barcelona in Catalonia. From 1998 to 2007, the Món Sant Benet project was designed, developed, and implemented by an interdisciplinary team lead by Caixa Manresa with the aim to become a tourist reference and to foster economic development in the central region of Catalonia. The visitor experience, very innovative at that time, consists of a series of guided tours adapted to different audiences, which presented the history of the monastery and of Catalonia through self-contained personal narrative fragments illustrated by holograms, video-mappings, and other types of animated projections in each architectural space. Impact assessment focuses on visitor numbers, economic impact, and heritage conservation. The analyses show that ten years after its inauguration Món Sant Benet has for the most part attained or established the base to attain its initial goals. Sant Benet de Bages (Fig. 1) is a Romanesque monastery located in the village of Sant Fruitós de Bages, 60 km north of Barcelona in Catalonia. It was built around 960 A.D. and is not only one of the most emblematic monuments in the region, but also one of the best preserved medieval monastic sites in Catalonia. Over the centuries, the monastery has witnessed striking events that have marked its activities and its architecture. After a long period of prosperity, the 1348 plague, several socio-political conflicts, fires, and a lack of maintenance sent Sant Benet into decline from the 15th century onwards. After 1620, the monastery was transformed into an Arts College, and subsequently it became the retirement home for the elderly monks of the Benedictine abbey of Montserrat (Monistrol de Montserrat, Catalonia). The monastery was active until 1835, when all monastic orders were abolished, and their goods confiscated. It was then occupied by workers from the nearby textile industry until 1909, when the place was acquired by Elisa Carbó, mother of the famous Art Nouveau painter Ramon Casas. The family hired the renowned architect Josep Puig i Cadafalch to undertake the restoration of the buildings as a summer house. Due to its rich history and cultural heritage, Sant Benet de Bages was recognized as a national monument in 1931 . In 2000 the property was purchased by Caixa Manresa, a private savings bank that later merged with the national bank Catalunya Caixa. The main aim of Valentí Roqueta, its director from 1992 to 2009 was to develop a visionary, multi-functional project gathering together cultural heritage, tourism, and pedagogical activities. The “Món Sant Benet” centre was inaugurated in 2007 and is managed since 2013 by Fundació Catalunya-La Pedrera (https://www.fundaciocatalunya-lapedrera.com/ca/home), a private foundation arising from the merging of several private and public Catalan savings banks. Fig. 1. Monastery of Sant Benet de Bages (Sant Fruitós de Bages, Catalonia). Image retrieved from . Món Sant Benet is a cultural heritage centre that aims to integrate cultural, tourism, leisure, and scientific services. It is organized around two key thematic areas: the “Alimentació i Ciència” (Alícia) Foundation and the museum project. The Alicia Foundation (http://monstbenet.com/en/alicia-foundation), conceived by the renowned cuisine chef Ferran Adrià, is devoted to high-level scientific research in the fields of food and health. At the same time, it seeks to promote the country's culinary heritage and to enhance scientific innovation in gastronomy. The museum project includes the medieval monastery and a modernist factory building. In the case of the Benedictine Monastery, visitors have the opportunity to become immersed in the history of the monument by means of multi-sensory guided tours supported by audio-visual technologies. The museum project also offers educational activities for schools, thus serving both the tourism and the educational sectors. The Món Sant Benet centre includes a 4000 sqm. convention centre; a four-star hotel; three restaurants (one of them awarded with a Michelin Star); a tourist information centre; and a shop with the most representative gastronomical products of Catalonia. The Món Sant Benet project was born with the aim to become a tourist reference in Central Catalonia . The project was undertaken by Caixa Manresa which, in cooperation with public administrations and the private sector, sought to foster economic development in the central region of Catalonia, traditionally less dynamic and diversified due to the attractor effect generated by Barcelona and the coast. The development of the project has been divided in three different phases: building dreams, building projects, and building realities . From 1990 to 2000, prior to the purchase of the monastery, Caixa Manresa worked to define a “Strategic plan for the tourism development of the Bages Region” (1998), in which they proposed a structured set of actions to place the territory on the Catalan economic map. This strategic plan already identified the monastery of Sant Benet as one of its key assets. 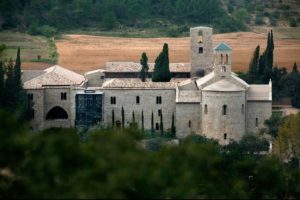 But the Món Sant Benet project truly began in 2000, with the purchase of the Romanesque monastery by Caixa Manresa. 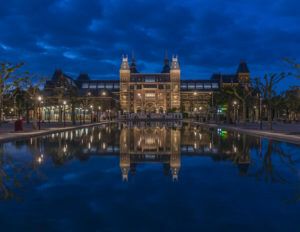 During the next four years, a team comprising economists, architects, engineers, cuisine chefs, hoteliers, cultural heritage specialists, and audio-visual professionals gathered together to define the central ideas and establish the master plan. Finally, the execution of the project took place from 2004 to 2007, with intense restoration actions in the monastery, the construction of the new facilities, and the creation of the museum project. Món Sant Benet was officially inaugurated on November 12, 2007. The final total investment amounted to 71 million Euro, from which 3.5 million Euro were devoted to the museum project. Fig. 2. On the left, visitors inside the monastery’s church. On the right, mapping and hologram projection in the church. Regarding the design and execution of the museum project, a first master plan had been approved by the Department of Culture of the Catalan Government. This project included the visit to the restored architectural remains and the exhibition of art works. However, it was decided that this would not be enough to captivate the audience; therefore, new strategies where implemented in order to build a story considering the values of the locality and the use of innovative tools. The museum project was placed in the hands of “Grup Transversal” (https://www.gruptransversal.com/), a company specialising in cultural productions, marketing, and communication projects. The project gathered, at a very early stage of development, a multidisciplinary team comprising a film director, a sound engineer, and a specialist in show programming. They were later joined by a lighting specialist, set designers, documentary makers, museologists, historians, etc. . This team design a series of guided tours were aimed at different types of audiences (children, families, specialized groups, etc.). 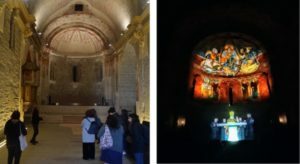 The visitor experience was very innovative at that moment because, instead of the traditional text-and-image presentation of facts and dates, it presented a 1000-year history of the monastery and of Catalonia through self-contained personal narrative fragments illustrated by holograms, video-mappings (Fig. 2), and other types of animated projections in each architectural space. One of the conclusions reached by the experts participating in ViMM project’s Working Group 5.3 is that impact assessment is still a pending aspect of Digital Heritage projects . In many cases, evaluation is undertaken at a very superficial level or results are not available to external individuals. The methodology followed in this Case Study was to interview key members of the original and current teams. During these teams, internal and public results were reviewed and discussed. At Món Sant Benet impact assessment relates to three main aspects: visitors, economic impact, and Cultural Heritage. In terms of visitors, the core team’s goal when starting the project was to ensure 140.000 visits a year. The numbers started with 120.000 visitors annually but have decreased to 90.000 visitors in 2017. The explanation given by team is that the original project was mainly aimed at the public of Catalonia. Món Sant Benet clearly contributes to the promotion of the monument’s and national history at a Catalan level, but it is unlikely that once visited they will come again. The team acknowledges the need to: 1) find ways to attract a broader international public; 2) establish measures to ensure repeat visits by local audiences. Regarding the former, one of the main problems is that there is no public transport system that connects the Monastery with the main cities around, especially with the capital cities connected with the rest of the world via train and plane. On the other hand, while there are some agreements with tour operators, there is limited communication with tourism offices from the administration. A solution already implemented by the team is to strengthen the relationship with government institutions, especially those related to tourism. Still, Món Sant Benet has a high number of pupils from basic and elementary school. The total numbers are around 300000 in 10 years . This means a nationwide strong presence in the educational sector that will continue stable if not increase in the following years. In terms of economic impact tow dimensions have to be considered. On the one hand, there is the direct occupation at Món Sant Benet’s facilities of approximately 100 people. 25 of them are employed by the museum project. On the other hand, thanks to the direct commercialization of products in the shop, the links with closer towns, the organization of workshops, and the hosting of events, an economic activity is generated around the Monastery. This includes transportation, hotels, food and beverages, tourism services, adventure activities, recreation, and travel trade. Fig. 3. Ramon Casas’ house at Món Sant Benet. Retrieved from . In terms of Cultural Heritage, the purchase and restoration of the medieval monastery and the modernist factory helped recover and preserve a heritage in total disrepair, almost close to the collapse. However, one of the main challenges was to install the technological and electrical equipment inside the buildings, while trying to affect as little as possible the architectural structure and keeping it invisible to visitors. In comparison with, for example, onsite augmented reality technologies or offsite immersive virtual reality technologies, the introduction of technologies that aim for an immersive experience in heritage buildings is challenging from the perspective of conservation. This means sometimes the impossibility to implement certain solutions and most of the time a greater economic effort to adapt new ones. Still, Món Sant Benet shows that it is possible to find engaging immersive and diversified solutions that are respectful with the monument. The key word here is “Mixed Reality”. That is, installations that are not imported universal solutions and that use “interfaces” based on actual objects related with the historical or heritage context (Fig. 3), which contributes to understanding, integration, and usability . Món Sant Benet is the result of a private, individual initiative, which ten years after its inauguration has for the most part attained or established the base to attain its initial goals. The project achieved the rescue of a cultural heritage asset of great historical and architectural value for Catalonia, which constitutes a tool to enhance the knowledge of history and to strengthening the sense of belonging and community. The project has also managed to generate a modest economic activity around the monument, but it should be consolidated and expanded in the following years. In the case of visit numbers, they do not fulfil the initial expectations of the design team, but the managing teams have identified the main causes and proposed or started to implement solutions to overcome negative trends. In any case, Món Sant Benet constitutes an example of a new model of social, tourism, and digital cultural project, designed and developed exclusively by private entities. We would like to express our gratefulness to Eudald Tomasa from Grup Transversal & Alba Tosquella from Fundació La Pedrera Catalunya who kindly assisted us with the access and analysis of information related to impact assessment. Pujol, L. (2011), “Integrating ICT in exhibitions”, Museum Management and Curatorship, 26 (1): 63-79. Taylor and Francis.